Happy Spring, you guys! Today I'm excited to bring you this colorful fruit-inspired féte from Cavin Elizabeth Photography and with amazing floral design by Bespoke. 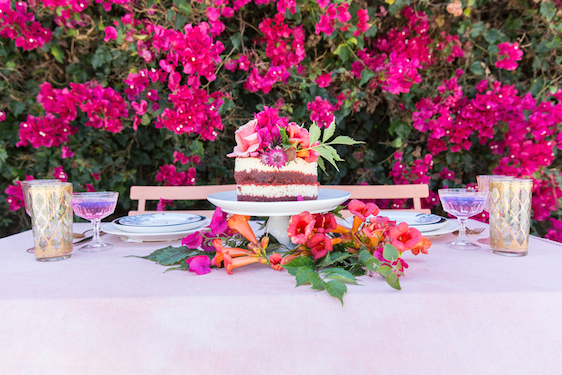 Created in front of beautiful bougainvillea of a private residence in San Diego, this tropical wedding design features a quaint sweetheart table that's absolutely packed full of color. With shades of vibrant pink and little pops of orange and green throughout — the table was topped with gorgeous vintage glassware, and the prettiest of fruits! Leah of Bespoke imagined a fruit-infused féte with a palette perfect for Spring! Her soft and vibrant floral arrangement was the focal point of the table, while different kinds of fruit were used to add a fun and tropical feel. This inspiration is perfect for couples who want to infuse color into their special day! Louise Letters' calligraphy place cards topped the plates and blended seamlessly with the design. No Comment to " Colorful Fruit-Infused Wedding Inspiration in San Diego "